Fresh off a pair of exceptional pitching outings in which Roy Halladay and Cliff Lee tossed the first back to back complete game for the Phillies (9-3) in 12 years, the 4-time defending National League East Division champions return home for a three-game series against the Florida Marlins (7-5). Against the Nationals on the road this week, Halladay and Lee were strong on the mound. The Marlins will be fortunate to miss each of those pitching stars, but will attempt to take down the balance of the Phillies' well regarded pitching rotation. 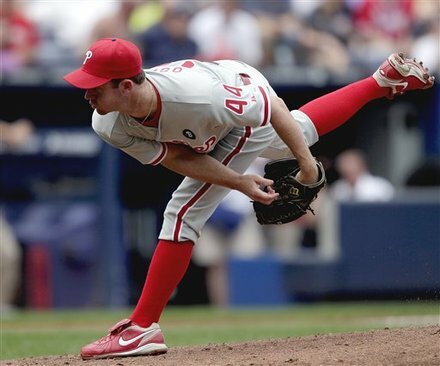 In game one of the series, Roy Oswalt looks to remain undefeated in his career at Citizens Bank Park. He will face veteran hurler Javier Vazquez, who hasn't had the same sort of success in Philadelphia. Read ahead for details on that pitching match up and the others, as well as loads more statistics from this weekend match up. Friday, 7:05PM. Javier Vazquez (1-1, 8.64 ERA) vs. Roy Oswalt (2-0, 2.25 ERA). The righty Vazquez is 12-8 with a 4.27 ERA in 28 career starts against the Phillies. In 4 career starts at Citizens Bank Park, Vazquez has a 1-2 record with a 6.08 ERA. Ross Gload is 16-for-35 (.457 avg) with 3 doubles, 2 triples, a HR and 7 RBI against Vazquez in his career. In 14 career starts against Florida, Oswalt is 6-4 with a .377 ERA and a .257 batting average against. In 14 career games at Citizens Bank Park, including the postseason, Oswalt is 11-0 with a 2.21 ERA. Hanley Ramirez is 11-for-28 (.393 avg) with 3 HR in his career against Oswalt. Saturday, 7:05PM. Anibal Sanchez (0-1, 6.97 ERA) vs, Cole Hamels (1-1, 5.59 ERA). The 27-year-old Sanchez is 3-7 with a 5.93 ERA in 11 career starts against the Phillies. In 7 career starts at Citizens Bank Park, Sanchez has a 1-5 record with an 8.73 ERA. Placido Polanco is 5-for-10 (.500 avg) with a double, a triple and a HR in his career against Sanchez. In 15 career starts against the Marlins, Hamels has a 4-7 record with a 3.73 ERA. In 18 home starts last season, Hamels posted a 3.14 ERA. Chris Coghlan is 6-for-13 (.462 avg) with 2 homers in his career against Hamels. Sunday, 1:35PM. Chris Volstad (0-1, 5.59 ERA) vs Joe Blanton (0-1, 10.45 ERA). The right-handed Volstad psoted a 5.73 ERA in 15 road starts last season. In 10 career starts against the Phils, Volstad is 2-3 with a 4.45 ERA. Raul Ibanez is 10-for-19 (.526 avg) with a triple and 3 homeruns in his career against the Marlins' 2005 top draft pick Volstad. Blanton is 5-2 with a 3.12 ERA in 8 career starts against the Marlins. Opponents are batting .378 against Blanton this season. Hanley Ramirez is batting .214 with a .603 OPS against righty pitchers this season, while he has posted a .364 average and a .909 OPS against lefties. In 22 career games against the Phillies, Chris Coghlan has a .357 batting average. Against the Phillies' three scheduled starting pitchers for this series, Coghlan is 16-for-27 (.444 avg). Marlins closer Leo Nunez has 1 blown save in 8 chances against the Phillies. Shane Victorino, Jimmy Rollins and Ben Francisco are a combined 1-for-15 (.067 avg) against Nunez. Ryan Howard ranks 3rd in the National League and leads the Phillies with 13 RBI. In 44 career games against the Marlins, Raul Ibanez is a .325 hitter with 7 HR. Ibanez posted a .367 average in 18 games against Florida last season. In the last week, Carlos Ruiz is 10-for-20 (.500 avg) with 2 HR and 6 RBI. Marlins team batting average- .264. Phillies team batting average- .306.